Drs. Lefebvre and Vieau have left to pursue other opportunities. We thank them for their service here and wish them well. 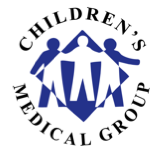 Children's Medical Group is staffed and equipped to see all our patients so please continue to use the office phone: 401-633-1100 as always. Our hours remain the same, as does after hours coverage for emergencies. All records remain with us and there is no interruption in patient care. We apologize if this news causes any concern or confusion but please be assured that it is business as usual. Thank you for allowing us to continue to care for your children. Saturdays & Sundays are by appointment for sick visits, please call between 8 am and 9 am, as our weekend hours are based on demand. Flu vaccines are strongly recommended, please visit our health guides page for more information on our flu clinics.